As I follow the Bitcoin currency since some time and as I do think the Bitcoin currency is a pretty interesting and new concept, I thought I should create some graphics with Photoshop. 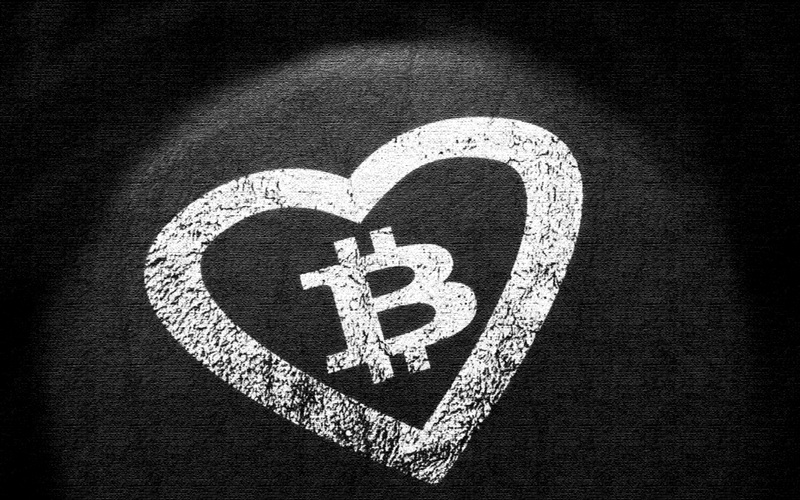 I wanted to use the Bitcoin symbol and added a heart around it. I created some Bitcoin images but was not happy with all of them, but I do pretty much like the image that I attached to this post. I might create different ones in the future because I noticed that there are not so much Bitcoin graphics out there. I might use the Bitcoin sign or Bitcoin symbol on different backgrounds that I create. I created the image to show my share, as I want to support Bitcoin. Whenever I see a Bitcoin related news, there are often the same images used in the articles over and over again, which is why I think that it makes sense to create new ones that can be used by writers. To help making this possible, I do release the image above in this article under the CC0 public domain license. So, if you are blogger or even media author who writes about Bitcoin, you can freely use the Bitcoin image above in your articles. The license counts for the image attached to this post, not to all images of my blog! The license counts only for images where I clearly mentioned in the post that they are public domain. The Bitcoin graphic above is released under the mentioned license and free to use. As said, I might create more in the future, if I am not busy or inspired by other things. If you need the file in bigger resolution, there is a bigger file on Wikimedia Commons. If you appreciate my work, you can tip me on the following Bitcoin address 1M5Un812riWoxkNokRNpiP9X9wEYUzGkCd. Awesome! What’s a Bit coin though? Bitcoin is basically a virtual currency. It’s a decentralized currency due to the fact that it is processed by a peer-to-peer network (nobody owns the network). This means there are no middle-mans such as banks or governments involved in the currency. More and more online shops accept this currency and it might become a popular payment variant but it’s still at the beginning. The good thing about Bitcoin is that there are low transaction fees due to the fact that no banks are involed, also the transactions are fast and you don’t even need to wait until monday to see a transaction going through, it works every day. Not even counry borders are a limit, you can send it everywhere, where people have internet. You can even accept tips on your blog if you put your created Bitcoin address anywhere on your blog but threre are many other ways how to use the currency. It’s just that it still stands at the beginning and the value of the currency is still very volatile. But anyway, I support the idea behind the currency. The whole technology is very interesting and in my opinion “the future of money”. Feel free to re-upload a version with a better resoluiton and to upload new pictures there. I would like to upload the the Wiki Commons but I never did something like that on Wiki. Maybe you are faster to upload the image 🙂 You can also drop a file link again here then, if you like. Because then I will add the Wiki link with the bigger image to my article as many asked me for a high resolution version.